I always think of this card as a variant on cascade. It actually has many of the same applications, but it’s helped by its game text being much more universal than that of some cascade cards. Incidentally, if you do cast a card with cascade for free, that’ll trigger its cascade effect, meaning that it’s a good way to start one of those chains that the Alara-era Jund decks were notorious for. It might feel a little bad if your draws didn’t go in quite the order you’d hoped and you don’t have a suitable card in hand, and thus have to use Electrodominance as “just” a Volcanic Geyser, but that itself is far from nothing. That also probably won’t happen quite as often in either Izzet decks that draw lots of cards, or decks that generate a lot of mana and thus can be both big and flexible in their choice of values for X. This is an…interesting and promising card. The first thing I think of is the ability to use this to cast the suspend spells from Time Spiral, like Ancestral Vision or Living End, while they’re in your hand. While decks had ways to make them work before, this is an instant-speed way to make things interesting with them. Beyond that, Electrodominance is…pretty good! You’re effectively giving a spell in your hand flash for two red mana, with the ability to burn their face in the process. Or something else, but there almost always is the opportunity to go for the face. 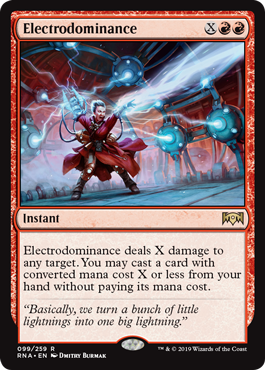 Electrodominance is probably going to be a powerful spell, combining the strength of one of the red variable burn spells with being, effectively, a two-mana flash effect. This might be more powerful in more powerful formats, but I’d be surprised if this didn’t see play.